Adding a glaze to a piece you are working on is a very quick and easy way to get more of an antiqued effect. 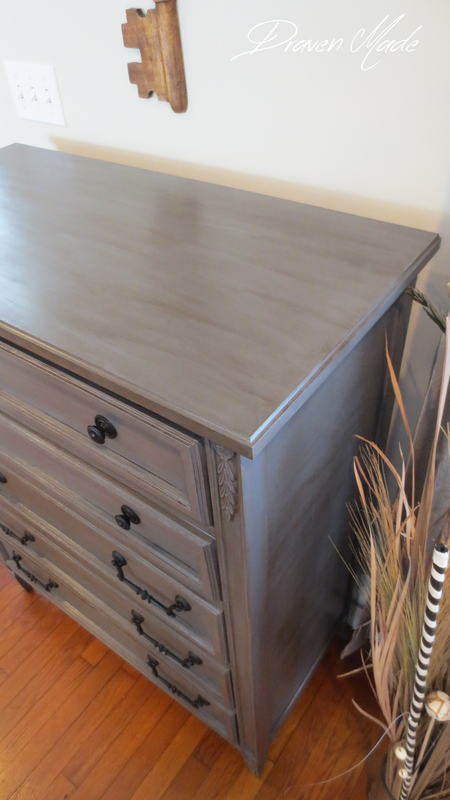 When painting furniture I’m always inspired by Restoration Hardware, and this gray dresser was no exception. I was digging RH’s “antiqued graphite” color, but wanted to take the antiqued wood “look” a little further with this piece. 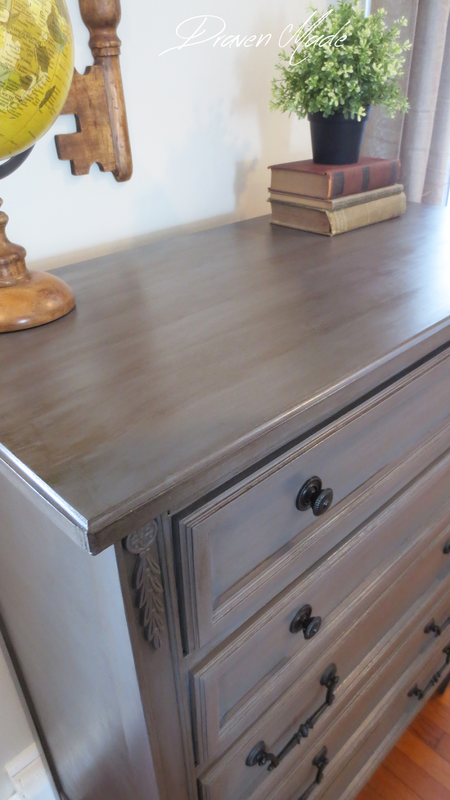 I’ve been working on refinishing this bronze gray dresser for most of this month, and it’s been another good learning curve for me for furniture painting. Disclosure: This post contains some affiliate links for your convenience. If you purchase anything from these links I may receive some kind of commission. However, I only mention products that I use and love whether I am compensated or not. Thanks so much for your support! I’d been inspired with the use of General Finishes glazes by other painters and wanted to give it a try. Glazes are very neat little mixes that brush-on semi-translucent, the excess gets wiped off, and you’re left with a beautiful finish that adds extra dimension to the base paint color (and they come in various colors). 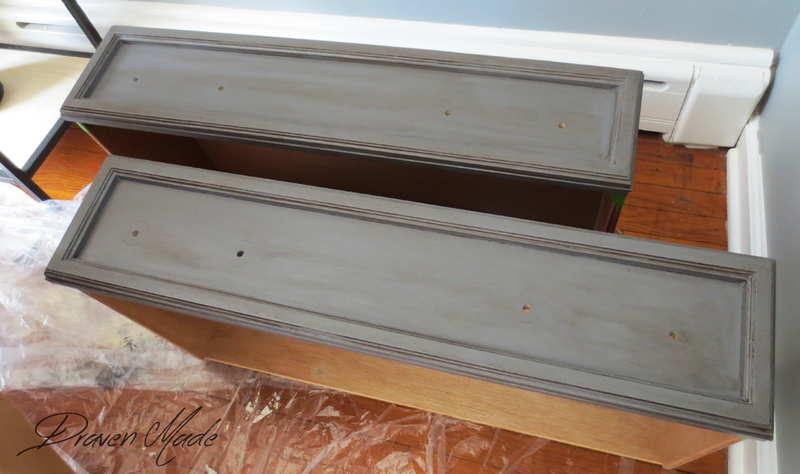 To start, I painted the dresser GF’s milk paint in Driftwood, a mid-tone grey, (see another example of it here) as the base color. After applying 2 coats of the milk paint and dry times in between, I waited for the last coat of paint to dry a few more hours than necessary and then it was time to get the glaze on (woot!). As this was my first time trying a glaze, I was a bit apprehensive to use it and mess up my work. Actually, I almost DID mess it up! Before applying the glaze I looked up the process one more time online to be sure I was doing it correctly, and if it hadn’t been for Suzanne from The Painted Drawer‘s sagely advice, it would have gone downhill really quickly! Suzanne said to apply a layer of GF’s high performance topcoat before doing the glaze. This way it’s easier to guide the glaze into areas you want it to go and wipe it off easily. I followed her directions and used GF’s Van Dyke glaze, a nice bronze or antique brown color. Thankfully it went on and wiped off perfectly. Dodged a bullet! When applying the glaze, I used a sponge brush and coated things in stages so that I didn’t risk the glaze drying before I could wipe it down. The drawers, for example, I did their front faces first, then the edge moldings. I broke the dresser down into doing only the top, or one side at a time. If this is your first time glazing, it is useful to start in an area that is small or not as noticeable to practice on and see how long to let the glaze sit before wiping to get the look that you want. For me, I let it sit no more than one minute before wiping. When wiping, I used a cotton cloth that did not leave behind any lint. An old and clean tshirt can work great for this. If you don’t like how the glaze comes out the first time, you can always wait for it to dry, then add glaze and wipe it again. 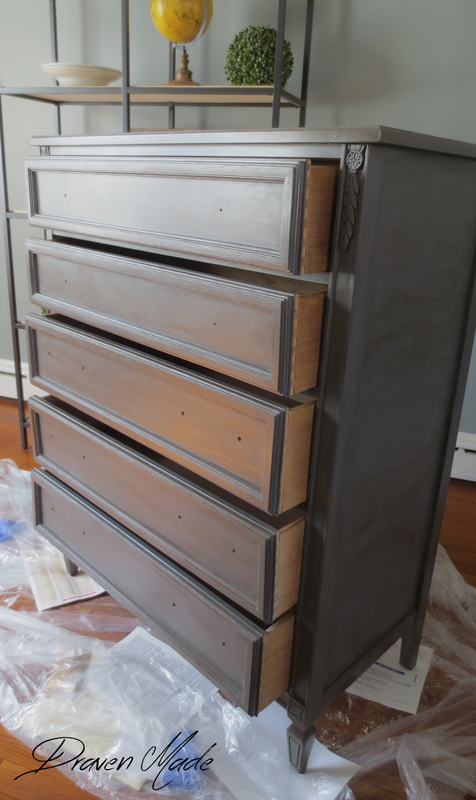 After the glaze dried I put on a few layers of the topcoat, painted the original hardware using GF’s Lamp Black, put a few protective topcoats in a Satin finish on them, and added them back to the drawers. I think it looks kind of steampunk. But that may just be me. Once again I’m in love with GF’s paints and the final look of this piece. It came out exactly as I had imagined it – always a good feeling. 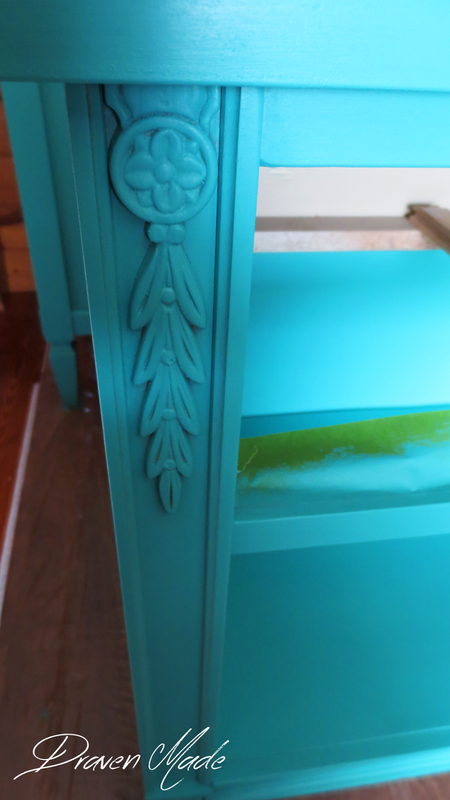 Want to paint your own piece of furniture? Check out my complete guides for how to prep your piece before painting and how to mix & use milk paint (using Miss Mustard Seed’s mixes). Beautiful makeover! I love the color and especially the hardware! Did you strip the dresser before you painted it? Hey there – we just discovered you at the Do Tell Tuesday link party! 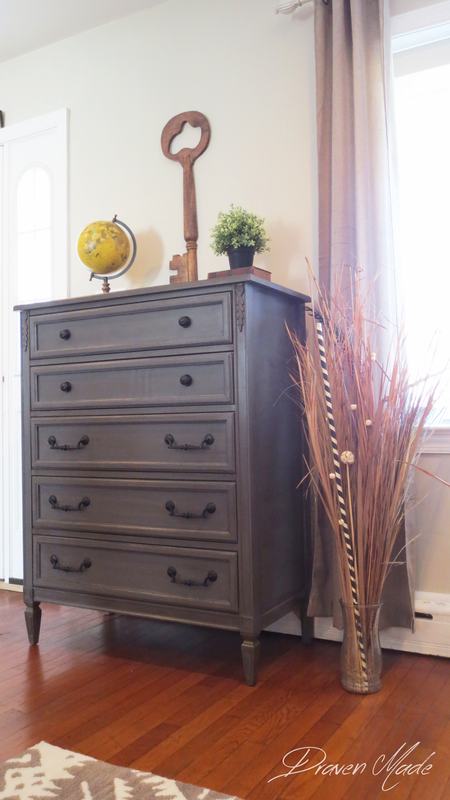 LOVE this dresser and the color finish. Great job. We have a link party Something To Talk About Monday – Thursday if you would like to link up! It's gorgeous! I love the color, the hardware, and the beautiful details. Thank you for sharing at Vintage Inspiration Party. Hehe, picking colors is always the hardest, yet also fun part! Thanks for your kind words! Hey – we wanted you to know that you are a featured link on our blog today! 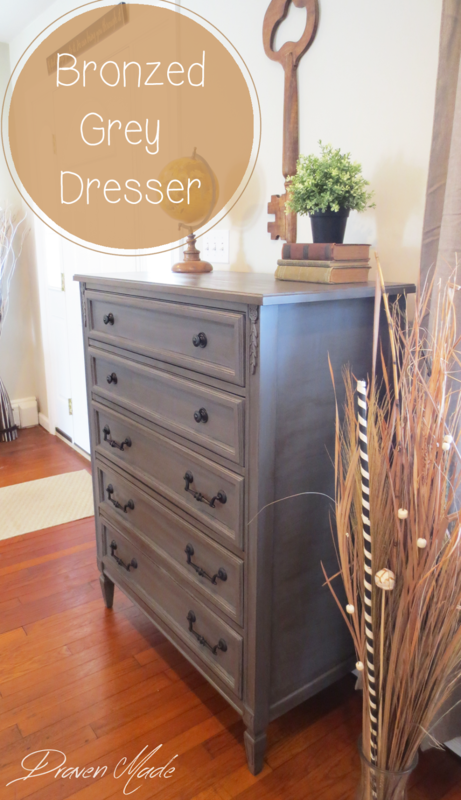 Our readers loved your painted dresser! Thanks so much for linking up! Thanks so much for the feature, Kathryn!! Beautiful work! I love the combination of gray and bronzey glaze. I am working on a small side table now and am so glad I read your post to help me do as good a job as you did. Cheers! Your dresser turned out beautiful!! Great tips, thanks for sharing at Catch as Catch Can. Catching you! Hi, I'm a new subscriber because of this dresser. Is this look still in style? Hi Robin, awesome to have you, thanks! :) Yes, this style is very much still going strong! Hello! I love this look. It is exactly what I am looking for for my nightstands that have a veneer finish. I have a few questions. Did you sand first? And at the end, the topcoat – is this a sealer…? Thank you! Hi Amy! Yes, always good to use a fine sanding pad, something 120 grit or more, to prep it for paint. :) The topcoat I used from GF is a sealer and works great at protecting the paint finish – highly recommend! Hello, your dresser is beautiful. It was what I am envisioning for my nightstands which have a veneer finish. A few questions – did you sand first? Also, did you put on a sealer at the end or is that what the topcoat is for? Thank you! Hi. Beautiful piece. I just did my first project, a headboard and footboard which came out nicely. 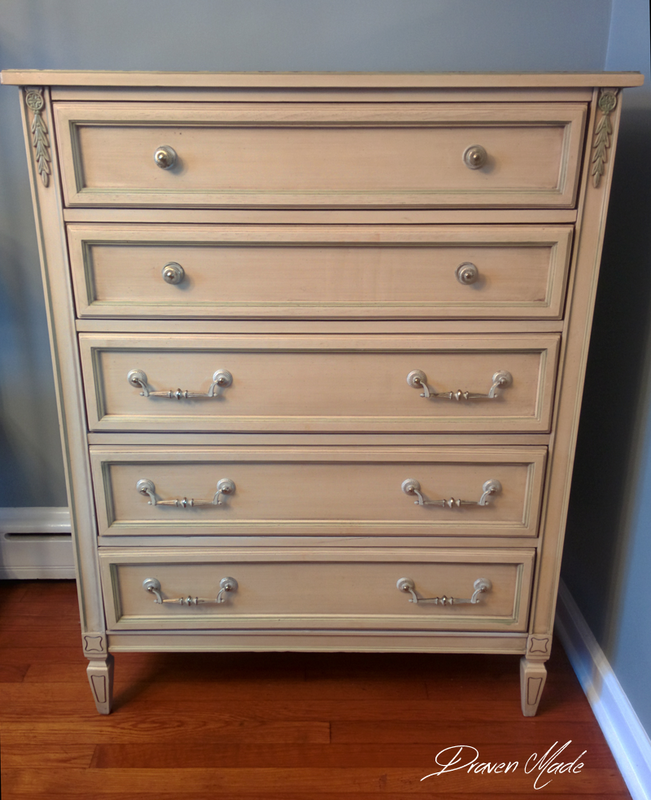 I have a question about your method for glazing the top and sides of this chest. Did you wipe off in straight lines al the way across, or alternate somehow? I had issues with how to do longer flat sections of the headboard and the freestanding cabinet I am going to do next will have even more long, flat areas. Thanks! Hi there, just wondering how long it took to paint this with all the steps and layering. Looks like many hours!! I have a client who wants this for 2 pieces but I am hesitant because it looks so labour intensive. Thanks! Hi, Dana! The painting of the gray took longer than the glaze – the glaze was the super-easy and fast part! In total from prep to paint to glaze to finish coats, it was probably 10 hours for this piece with most of the time being spent on the painting because it was a large piece. Hi Kelly! 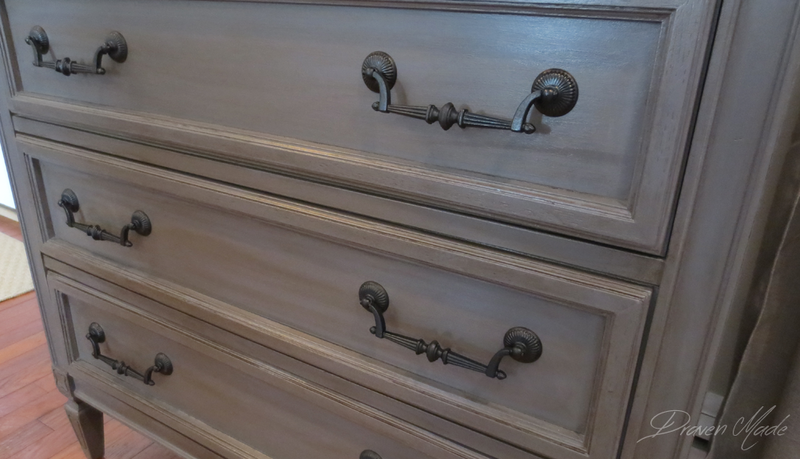 I absolutely love this piece and have had a hard time finding exactly what I wanted for my great grandmothers old farmhouse bedroom set until I saw this! I got all the same GF products you used. Thank you! Quick question… did you sand between the paint and first top coat before the glaze?? I see in GF website they recommended it but I attempted it on my bench (my practice piece) and it seems to take off more paint that I want even with 400grit sand paper. I’d prefer not to sand the bedroom set (which is painted the Driftwood and looks awesome so far! Can’t wait to get glaze on!!) Thanks Kelly! Hi, Emily, so glad the post helped! :) Although GF does recommend sanding between coats and finish (and I tried it once on a small area too), I’ve never done it since for the same reason as you stated and I’ve never had a problem with the paints/finish bonding. The most important time for a light sanding is before getting any paint on the piece. Sounds like you’re moving right along in your project and having fun! Feel free to send along any pix of your pieces as I’d love to see them! Hi! I’m Kelly, mama to my lil girl and wife to my main squeeze, Karl. Together we’re slowly restoring our fixer upper, a circa 1900 Victorian Foursquare in PA. Join us in our passion for old homes, diy and design and follow as we lovingly restore our dream home. Get our home restoration updates, DIY tutorials, and project inspiration delivered to your inbox! Friendly reminder: Please keep in mind that all images and text on this site are property of Living in a Fixer Upper. If you are creating a round-up style post, feel free to use one image from the article and link back to that post. Pinning is always welcome and appreciated! Thank you! Living in a Fixer Upper is a participant in the Amazon Services LLC Associates Program, an affiliate advertising program designed to provide a means for sites to earn advertising fees by advertising and linking to Amazon.